During the end of my high school career, heading into the summer before freshmen year of college I was playing in a 7’s tournament. We were 3-0 at the time and facing a tough opponent next. The game got out of hand quickly and I was subbed in just before the first half was about to end. My first touch on the ball came and I was ready to pass the ball and keep the flow of the game going. I looked up and saw a defender rushing at me. I drew the defender and passed just before he got to me like you are supposed too. When I let go of the ball, the tackler did not let go of me. He had me around the neck and whipped me backwards straight onto my shoulder. I could not move from the ground as I tried to push myself up and shake it off to keep playing. I layed there in pain until the coach and my father came to help me up. They took me to the sideline where they put me in a sling that was meant for an elementary school kid. My dad got me in his truck and we drove two hours home to get to the hospital closest to our house. They took X-rays and told me that I separated my shoulder and tore all the ligaments connecting my AC joint. I went through the rest of the summer in slight pain and received a cortisone shot before I was headed off to college. My plan was to play my first fall season of college and get surgery done afterwards. Luckily, this plan worked and I was able to play the whole season. After the season, when I went home for Winter Break I was prepared for surgery. I went to the hospital where they put me to sleep, opened up my shoulder and leg and started performing the surgery. They removed a piece of my hamstring from my leg to use as a replacement for my shoulder ligaments. They then cut my shoulder open, drilled holes in my collarbone, put tiny pieces of metal on each end and fed the hamstring through. Once the hamstring was wrapped around my shoulder it was tightened and tied to ensure my collarbone was no longer popped up. When I woke up I was pretty angry. I had never been in that much pain before in my life. For the next couple weeks I was on the couch resting as I couldn’t go anywhere or move my shoulder on my own yet. The months following the procedure I went through physical therapy two, sometimes three times a week to get my shoulder back to strength. For four months I was recovering and being challenged at therapy every time I went. The recovery program was painful but beneficial for me. 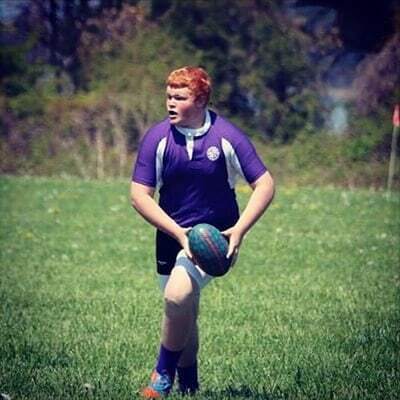 I had to get back to playing rugby again no matter what it meant. I was in a sling for 6 weeks which kept my shoulder stable during its weakest times. I moved out of it and had to do a little more on my own day by day. 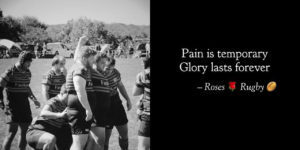 During the four months I was out of rugby, it was very hard to watch from the sideline. Watching my team play knowing I couldn’t was heartbreaking but I worked harder knowing that I was going to play when I came back from it all. Four months passed and I flew home to go see my surgeon. He told me I was cleared to play again and that everything looked really good in my shoulder. About a week or two later my college team was playing a 15s match which I played with no problems. Being back on the field was something I waited what felt like a lifetime for. There was nothing better than being next to my family again on that field. Being injured was a huge test for me but it only made me tougher through the recovery process. Being away from the game for that long was tough, but being able to still play afterwards is something I am very thankful for.